In my opinion, the Thai way of grilling a whole fish, is one of the best methods I’ve seen anywhere. A thick layer of salt crust covers the whole fish so the flesh inside keeps moist and succulent throughout the grilling process. And along, when eaten along with a garlic chili seafood dipping sauce, a Thai grilled fish (pla pao ปลาเผา) makes for an amazing meal! 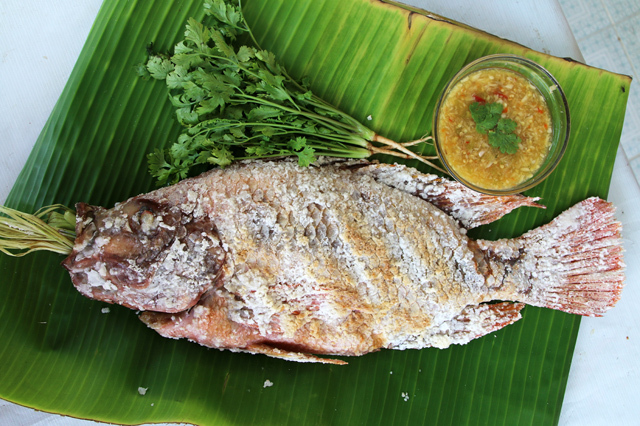 For this recipe (and especially in the video) I’ll be grilling two different kinds of popular Thai street food fish, a red hybrid tilapia known as a pla tabtim (ปลาทับทิม), and a snakehead fish known as a pla chon (ปลาช่อน). Both are good, but overall, I prefer the pla tabtim (ปลาทับทิม). 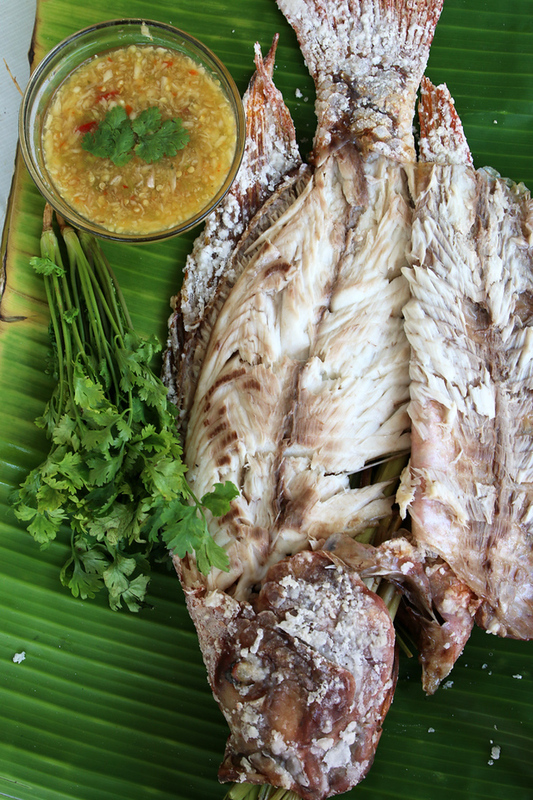 You could also make this Thai grilled fish recipe with a different kind of whole firm-ish kind of fish. Before getting started preparing the fish, I like to first get the charcoal lit. That way there’s a nice bed of hot charcoal as soon as the fish is dressed and ready to go. Later on, when you’re ready to grill the fish, you want to make sure you have a nice bed of charcoal, but you don’t want the heat to be too strong – which might burn the fish. Before grilling, spread out the coals, and if you have some leftover previous charcoal ashes, it’s a good idea to tone down the fire a bit with a layer of ash. You want a nice low, but even, heat for grilling. You’ll be stuffing lemongrass inside the fish! There are two main parts that make up any Thai grilled fish recipe (pla pao ปลาเผา), the whole grilled fish, and the accompanying sauce, known in Thai as sauce seafood (or nam jim seafood น้ำจิ้มซีฟู้ด). The first step to is stuff the lemongrass stalks and kaffir lime leaves into the fish. The fish fully loaded with lemongrass sticking out the mouth, you then coat the skin with a thick layer of salt mixed with a spoon of flour and water. It’s almost like putting plaster over the fish. Once you’ve got the fish nicely coated in a bath of salt crust, hopefully your fire is ready, and that’s when you start the grilling process. For this recipe, I grilled the fish for about 20 minutes on each side, for a total of about 40 minutes – but this is all dependent upon how big your fish is and how hot your fire is. Aim for a low heat to cook slowly. As soon as the fish is on the grill, you can begin to work on the Thai seafood sauce. It’s such a simple sauce, yet it’s also one of my all-time favorite Thai sauces. I can literally drench my food in this stuff, or even drink it, it’s that good. For Thai seafood sauce, you can use normal Thai bird chilies, but I like it better with prik kee noo suan (พริกขี้หนูสวน), as they have a bit more of a sour fragrant flavor to them – these are especially commonly found in the south of Thailand. 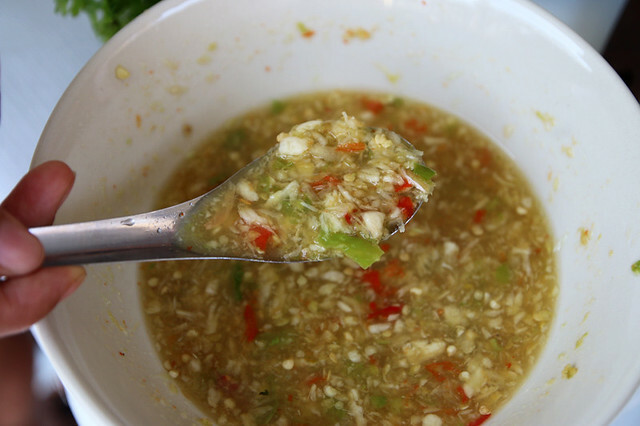 The Thai sauce seafood (nam jim seafood น้ำจิ้มซีฟู้ด) is made from a combination of pounded garlic and Thai bird chilies (prik kee noo suan) mixed with fish sauce, lime juice, and sugar. It’s incredibly garlicky, spicy, salty and sour. Keep an eye on the fish, make sure they don’t burn! Once you take your fish off the grill, all you have to do is make an incision across the top, and then the skin should just slide right off the side of the fish, leaving you with a moist and beautiful fillet. Eat it with: Pla pao (ปลาเผา) is very common to eat in Thailand along with Isaan food – that means it’s often accompanied by side dishes of som tam, larb moo, and usually Thai sticky rice. That being said, plenty of people, including myself, prefer pla pao (ปลาเผา) just with regular steamed rice. 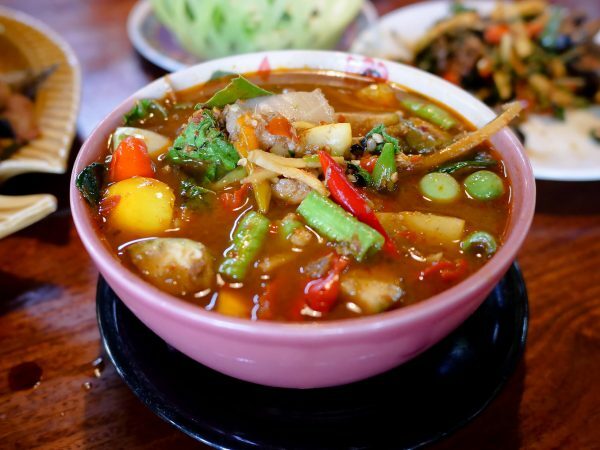 For more of our authentic Thai recipes, be sure to click here. I think one of the best ways to eat a whole fish is by grilling it the Thai way, known as pla pao (ปลาเผา). The fish is coated in a thick layer of salt, slow roasted over charcoal, and eaten with a garlicky spicy chili dipping sauce known as sauce seafood. Make sure you watch the video of this recipe here: http://youtu.be/TuZ_0A97xRU Enjoy! For more of my authentic Thai food recipes, click here. When you buy your whole fish, ask the vendor (or yourself) to do two things: One, try to remove the guts from the gills of the fish, without slicing the fish open on the belly, and two, leave the scales on the fish (if you have the choice). Probably the first thing you want to do (if you’re using charcoal, which I would recommend), is to get the charcoal going first, so it's ready when the fish is prepared. Make sure you rinse your fish with water and then pat them dry with a paper towel. Take your lemongrass stalks and beat and bruise them with something hard, like a mortar, or a rolling pin or something like that. This is going to bring out the lovely flavor of the lemongrass. Also prepare a small handful of kaffir lime leaves. 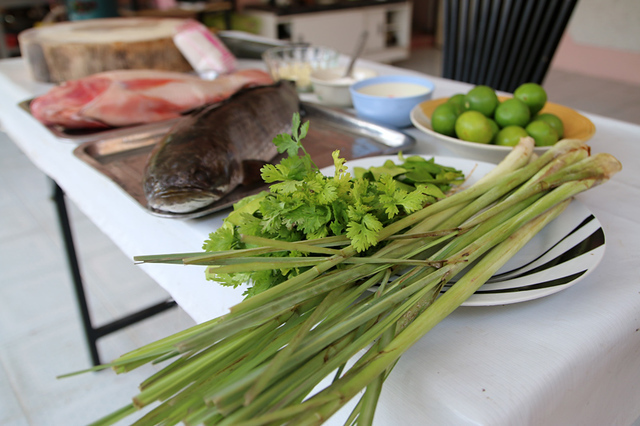 Fold the lemongrass in half and begin to stuff the fish with a stalk of lemongrass and about 10 kaffir lime leaves. Depending on how big your fish is will determine how many stalks of lemongrass you can fit. I put 2 - 3 lemongrass stalks in each fish in the video. Make sure it’s tight, but also make sure not to push so hard that you break the flesh of the fish. In a large mixing bowl or pan add ½ kilo bag of salt, sprinkle in 2 tablespoons of all purpose flour, and add about 1 tablespoon of water. Mix it up thoroughly, massaging the mixture with your hand, until it’s fully mixed. You want the salt to be a little moist so it sticks to the fish easily. Add the fish to the pan and start plastering it with the salt mixture. 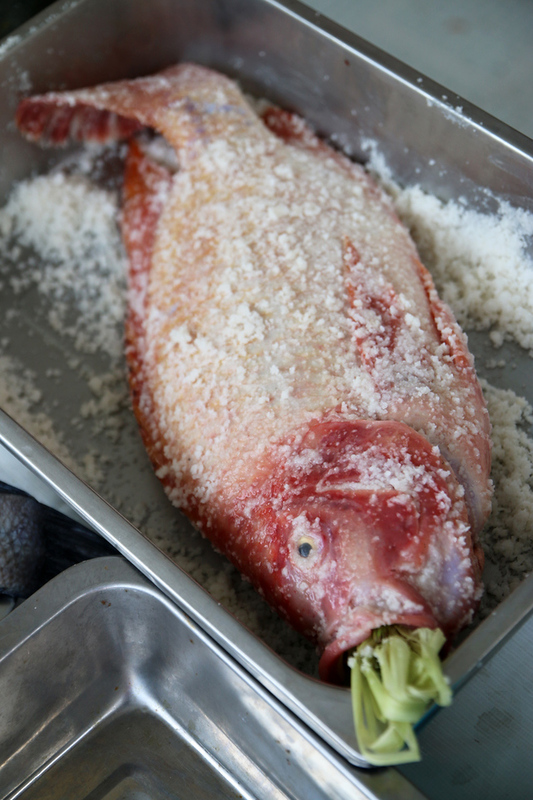 Pat and rub the fish with the salt, making sure to cover the entire fish, and all over the head and tail. Do the same to both fish. For grilling the fish, you want to have a steady, yet quite low heat. Make sure you have a bed of coals, and if they are too hot you can either tone them down with a scoop of ashes, or push the really hot coals to one side of the grill and put the fish on the other side (using a little indirect heat). 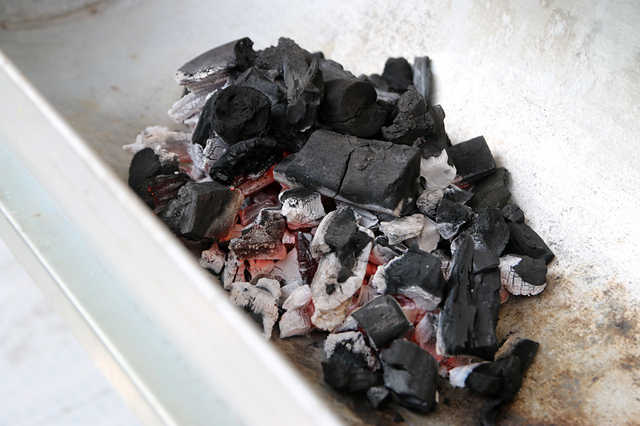 You can also add more coals as you keep on cooking. You want to slow cook the fish without them burning on the outside. My fish took almost 1 hour to grill. So aim for low heat for slow cooking. Once your fish is on the grill, it’s time to get started on the seafood sauce (below). Try to wait for about 15 minutes before you flip the fish. If you flip it too early, when the salt hasn’t dried out completely yet, the fish skin might get stuck onto the griddle. Flip the fish as little as possible. Keep roasting until the fish feels firm and the white salted skin has turned crusty and golden. It should take about 45 minutes to 1 hour. Take the fish off the grill, and set it on a platter. To eat the fish, you can either use a knife or scissors, and from the top of the fish, cut through the skin. The skin should cleanly lift off the fish revealing moist and beautiful meat. Thai grille fish (pla pao) is delicious with both sticky rice and white rice, and lots of seafood sauce! 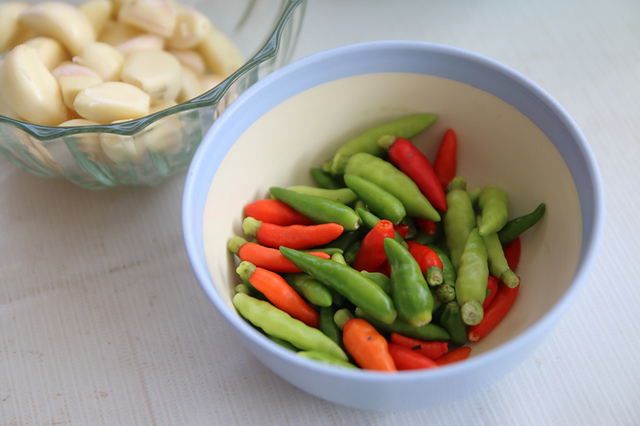 Peel about 15 cloves of garlic and grab about 20 Thai bird chilies (prik kee noo suan พริกขี้หนูสวน). Normal Thai chilies will work too. Pound ½ teaspoon of salt, the garlic, and chilies using a mortar and pestle. Doesn’t need to be super fine, but make sure there are no big chunks. In a bowl, add the pounded garlic and chilies, 6 tablespoons of fresh squeezed lime juice, 3 tablespoons of water, 2.5 tablespoons of fish sauce, and 1 tablespoon of sugar. Mix everything together until the sugar is dissolved. Taste the seafood sauce. Really, it’s up to you how it tastes, but you want it to be slightly salty, sour, and slightly sweet. If you need to add a little more of anything, go for it! You should eat your Thai grilled fish (pla pao ปลาเผา) by dipping bites into the seafood sauce. Or you can get a plate of rice, add bites of fish to the top of your rice and spoon on some seafood sauce. The fish with be grilled and moist and the seafood sauce always bursts with flavor! A nicely cooked juicy Thai grilled fish (pla pao ปลาเผา), with a pungent garlic and chili dipping sauce, is one of my all-time favorite meals to eat on the streets of Thailand! If you love fish, you should not wait any longer before trying out this Thai grilled fish recipe (pla pao ปลาเผา). 40 comments. I'd love to hear from you! I forgot to rate it! Sooooo Good-100 stars if I could!!!! Hi Mark, made this for dinner tonight and it was sooooo DELICIOUS! My boyfriend who is not a fan of eating fish devoured it! Thank you very much for sharing your recipes and adding how to videos and colorful pictures. Haha-I’m a huge fan! I follow you here on Pinterest, Instagram, and Facebook. P.S. Can you please do a moo ping recipe? Love your recipes! I just made pla pao using a Finnish fish called kuha. Its pretty much like seabass and it was just crazy good! Pla pao and gai yang will be on this summers brq menu for sure! Thanks for sharing this recipe. 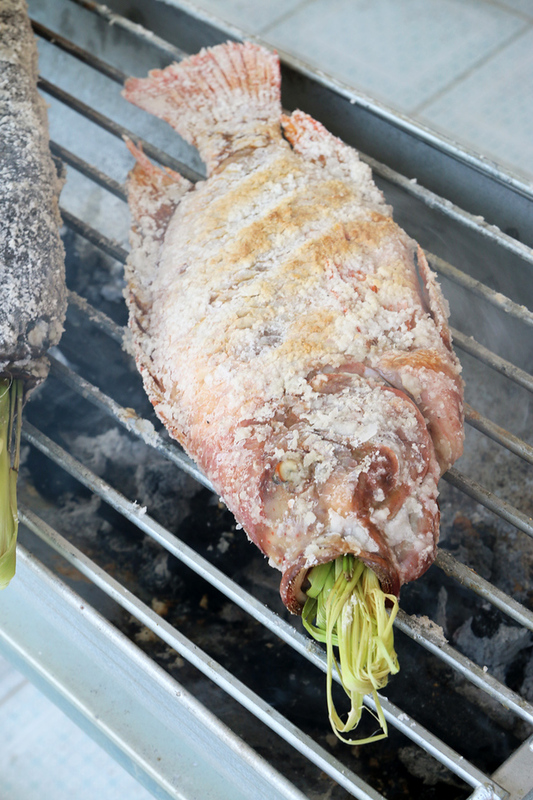 I think any master of the grill knows that this is one of the best ways to grill a fish, as that salt crust seals in so much flavor and juice. I like to add a few knots of pandanus leaf and galangal slices to the cavity of the fish when I make this as well. Makes for a most assuredly Thai set of flavors. This looks so amazingly delicious! I just made the sauce in preparation for the bbq fish tomorrow and while it’s so simple it’s so amazing good. Can’t wait to have this dish tomorrow. Thanks for posting this recipe! Nice post! I was in Bangkok last week and had a few of these Pla pao with the wife. It is one of our favorites when in Bangkok. I was told many times it is “red snapper” but it doesnt look or taste like a snapper (despite the 50thb extra they charge for this fish as compared to a tilapia…). Out of curiosity: how much should a grilled fish cost in Bangkok (street food price). Thanks! Depends on the fish, of course. I’ve seen up to 300 (which is of course really steep), but this was during Chinese New Year in a highly touristy section of Chiang Mai. I’ve also seen Pla pao go for 100 baht in rural parts of Thailand. Anyways, white snapper and tilapia look similar when grilled. Nevertheless, is it worth squabbling over 50 baht? 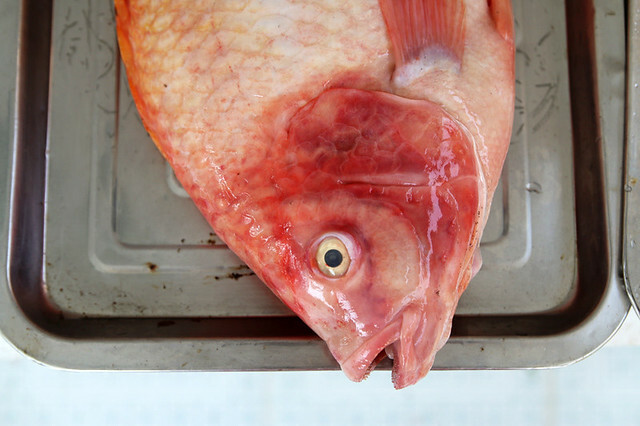 For a red snapper ‘pla pao’, you ought to be paying 150-200 baht. I have not tried out the char grilled lemon grass fish just as yet. But looking forward to that next week. We are visiting Bangkok in November and will definitely try out as many seafood dishes as possible. Thanking you in advance and can’t wait for the forthcoming visit. My two nephews are married to Thai girls, now I know why. Hi Mr. Susil, great to hear from you. Glad you’ll be visiting Bangkok soon, hope you enjoy some seafood, and have a great time visiting family! 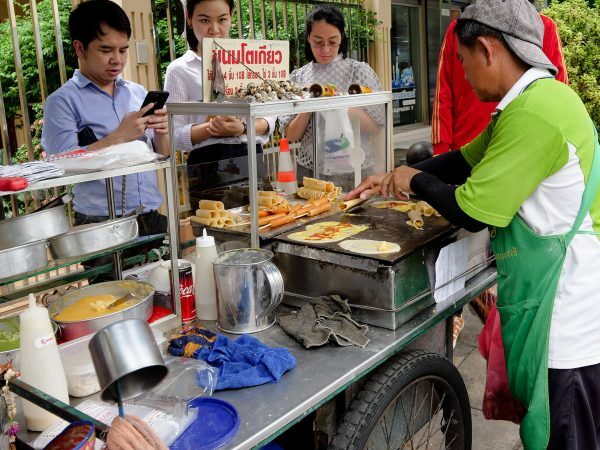 When I went to Bangkok recently I have tried this fish on the streets.It was amazingly tasty.But I did not know the recipe but I used see them dunk the fish fully in salt early in the morning and start grilling them in the evening. Thanks for your recipe. Last week I tried your recipe of grilled chicken and it was soooooooooooooooooo awsome! Thank you very much, Mark Wiens! This week I would like to try this recipe. Do you think salmon can work, too? Hey Phuong, that is awesome to hear, glad you enjoyed it. Yah, I think salmon would work well, let me know how it goes! First time trying it at the floating market over the weekend and I must say it was really good. My friend and I were enjoying the freshness and sweetness of the fish. Hey BK, awesome to hear that, glad you enjoyed it! Well Mark, cooking Thai food where I live is pretty expensive. I wanted to buy a whole fish to make your grilled fish recipe. It cost $18.00 for a 3 1/2 lb fish with guts and scales. Galangal is over $7.00 a lb. and I had to look over two cities to find it. Very little fresh Thai veggies. I’ll let u know how it turns out. Hey Coreen, great to hear you got the ingredients. Let me know how it goes and enjoy! Hi Harris, there are a bunch of street food stalls right outside of Central World usually at about 5 pm each evening. But I need to double check to make sure they are still open as many things are changing in that area. We ate this week this fish 3 times last week just as a way to say good bye to Thailand.Once you know it you can’t miss it. We stayed at Bayoke Sky and in that area you see them baking pla Pao everywhere. On the streets, in small restaurants.. I live in the U.S. What could I use instead of lemon grass and kafir lime leaves? Do you live in a big enough city to have an Asian grocery store? Both lemongrass and kaffir lime leaves are quite widely available in the US. But if not, since in this fish recipe they just provide a bit of fragrance, but are not actually eaten, you could either omit them, or you could try to use something like a lemon peel. Enjoy the cooking! hi may i know if i can use the oven to bake this cake? tia! Hi Kat, I’ve never tried before myself, but I think it would work… let me know if you try it. Lol! I just realised I typed cake instead of fish! Guess I’m too obsessed with baking cakes. Anyhoos, I did tried it a few days back. It kinda works but lacks the smokiness which you can only get from using charcoal. But nevertheless fish was really moist and tasty! I’ll be back to Krabi in April. Can’t wait to devour it of the grill! Thx for sharing this! Hey Kat, ha, no worries, I often do the same thing with the word “food.” Thanks for sharing, glad the oven baking worked. Hi Phu, I’m so happy to hear you enjoyed this recipe, thank you! AWESOME recipes Mark. I’ve missed pla pou and nam jim seafood so much since I lived in Thailand and now I can make it for myself! Your instructions and proportions are really spot on. I’m so excited to bring Thai cooking into my home in the US. Thank you thank you thank you! Hey Kat, great to hear from you. Thank you very much for your kind words, glad you enjoyed this recipe, and also that you love Thai food too! I really like this dish and tried to follow your recipe. Unfortunatelly I was not able to make the salt stick to the fish (follow your instruction). Do you have some hints how to make it stick? Hi Flo, thank you very much. Hmmm, I’m not totally sure, do you think your salt and flour mixture was too wet, maybe, or too dry? That’s what I think could make it harder to stick. You really only need to plaster a layer around the fish, and it should dry out and start getting crusty when you start grilling it. Hope this helps. Love this dish, as I love lots of others – fried rice, papaya salad, larb, etc. Need to get into the kitchen and start cooking. Thanks for bringing this to us Mark. You’re welcome Clifton, thank you for your support. Can you advice me the correct brand of fish saus used in the recipe? I cannot wait to try this recipe. 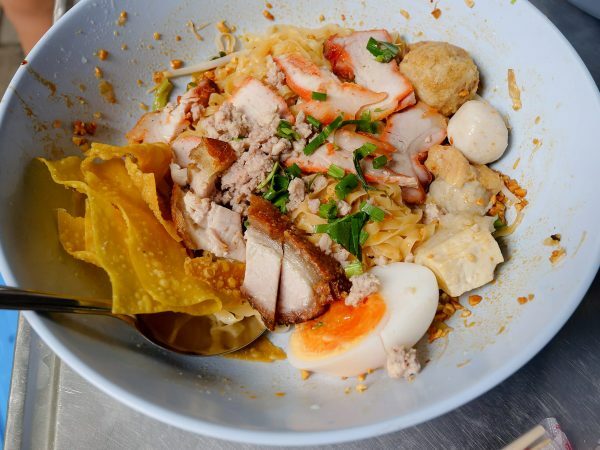 This was one of my favorite dishes in Bangkok. As soon as winter is over I’m firing up the grill. I’ll probably start to practice making that sauce though, I’m sure I can find something to dunk in it. I hope gai yang is going to show up here soon too.